AudioDesk is a full-featured audio workstation software package for Mac OS X, Windows 7 and Windows 8. AudioDesk provides all of the high-end features you'd expect in a professional workstation application, like 24-bit/192-kHz recording and real-time, 32-bit effects processing. The software includes multi-track audio editing, sample-accurate placement of audio, a complete virtual mixing environment with up to 64 stereo busses, automated mixing, graphic editing of mix and effects automation, scrubbing, trimming, spotting, crossfades, support for third-party AU, VST2, and MAS effects plug-ins, unlimited digital track bouncing (including effects and automation), and much more. AudioDesk does not place artificial restrictions on the number of tracks you can work with. Unlimited audio tracks means AudioDesk is ready for as many tracks as your computer will allow. 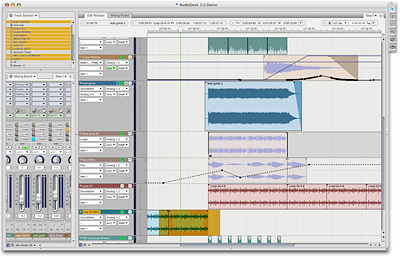 View your audio tracks in a single, unified mixer. Configure up to twenty effects inserts per audio channel, and 32 stereo busses. Everything is automatable, including effects parameters with five advanced automation modes, beat-synchronized effects and sample accurate editing of automation data. The automation system features a rich set of user interface technologies such as event flags for discrete events and spline tools for manipulating control points. Automation parameters are displayed in meaningful real world values such as decibels and milliseconds - not arbitrary values (0-127). AudioDesk includes dozens of real-time DSP-effects with easy to use graphical controls and complete automation. Combined, these included effects meet all the demands of today's audio production process; you'll find two, four and eight band EQ, tube-simulation and distortion effects with the flexible PreAmp-1 plug-in, reverbs, a compressor, a synthesizer-style multimode filter, echo & delay effects, chorus, phaser, flanger, and more.